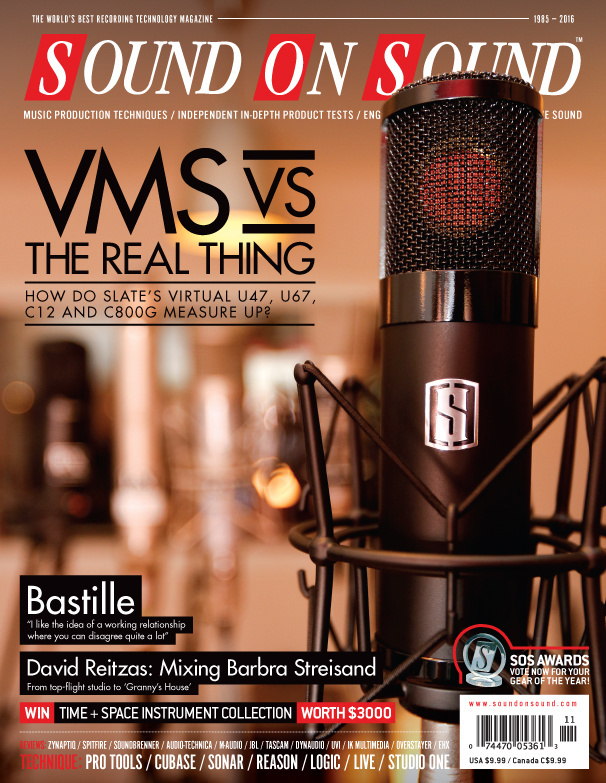 Reviews: Slate Digital Virtual Microphone System, Spitfire Audio Hans Zimmer Piano, Soundbrenner Pulse, JBL Eon One, Tascam DR-680 MkII, Dynaudio LYD 5 & 8, Orchestral Tools Solo Strings. Technique: Session Notes, Studio SOS. Features: Dan Smith & Mark Crew: Producing Bastille’s Wild World, Choosing A Compact PA System, Inside Track: David Reitzas, Agnes Obel: Producing Citizen Of Glass. It’s the feel and syncopation of the performers that make this collection of Brazilian percussion grooves what it is. Given the continually evolving and demanding pressures of the pro-audio industry, any product which remains available and largely unchanged for more than a decade must have arrived at a near-perfect combination of technical excellence, operational usability, reliability, and price. Despite keeping things simple, EHX’s latest looper boasts some useful features that others lack. These overdrive pedals are both inspired by the now out-of-production and highly desirable Klon Centaur, used by David Gilmour and other luminaries. JBL’s Eon speakers have been a mainstay of portable PA for years — and now they’re joined by this smart new active column system. M-Audio’s latest interfaces offer a lot of bang for relatively little buck and utilise the up-and-coming USB Type-C connector. Orchestral Tools expand their series with a quartet of solo strings and a pair of intimately-recorded soloists. The Cali76 puts the sound and feel of a Urei 1176 into a guitar pedal, providing epic compression and sustain with studio-like transparency and low noise. In a market that seems, er, saturated with dedicated distortion processors, what sets Overstayer’s latest device apart from the rest? Can this unique combination of software and hardware really recreate the sound of some of the most revered microphones in the world? We put the VMS up against the originals to find out! This plug-in is based on engineer/producer S Husky Höskulds' Ampex reel-to-reel tape recorder, which he had modified to act as a distortion processor. This library is built around 100 rhythmic ‘themes’ where each theme is, essentially, a set of audio loops that form something akin to a ‘cinematic drum cue construction kit’. Spitfire Audio delve deep into a legendary film composer’s favourite piano. Attack EP88 is an elaborate, 47,000-sample presentation of a vintage 88-key Rhodes Mark I prepared with a brass tack on the surface of each hammer, guaranteeing a Rhodes attack like no other. Developed in collaboration with top mixing engineer Andrew Scheps, Waves' Scheps Parallel Particles plug-in is probably the closest you’ll get to a ‘more of everything’ processor. We’ve come to expect the unexpected from Zynaptiq, and their new reverb delivers just that! The making of Barbra Streisand’s latest hit album, Encore, offers a window into the unique philosophy of hit-making producer and engineer David Reitzas. Flex your Logic Pro X muscles with half a dozen more tips and tricks. Our engineer transforms a bedroom-recorded rock song into release-ready territory. The loudness wars might be over, but peak levels in Pro Tools are still important. We show you how to get the most from Ableton’s Link technology in Reason. Recording the Winchester College Quiristers with a view to bringing their plainsong performances to a wider audience presented a unique challenge! Sonar has several time-saving features that might make the difference between catching an inspiration or losing it. While home recording has become much less costly in recent years, there are still some expensive items on most people’s wish lists. So how do you work out what to splash out on when budget is an issue? Private Wilhelm: screaming through cinema’s lazy history of sound effects. After almost two years of construction, overseen by architect Marcelo Tavares, the studio opened in early 2012 in a purpose-built facility, conceived as a multicultural space where people from all over the world can feel inspired. Despite great progress elsewhere in the TV business, music for the media is still overwhelmingly dominated by men. Why? Media content for the November 2016 issue.